Whether you’re based in Bordeaux or Biarritz, great golf courses and great beaches are within easy reach of each other to ensure rest and relaxation at every stage of your holiday in south west France. The beaches of the Atlantic run almost uninterrupted down France’s west coast, and are linked by an excellent, flat network of cycle paths – the EuroVelo 1 – that can in an instant turn a beach and golf holiday into an active family break as well. Here are some of our favourite beachy bases within easy reach of Bordeaux and Biarritz. Lacanau is a popular beach about 45 minutes west of Bordeaux with plenty of parking, as well as restaurants, bars and shops – ideal for when you want to take a breather from the golden sand. There is a North, South and Central beach, each with its own access to the sand. 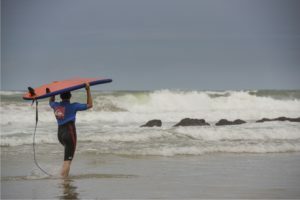 There is good surf here year-round, though the waves tend to be bigger in spring and autumn. Even so, every August, a world tour qualifying event is held here, complete with commentary, beach bars and entertainment. There are plenty of shops hiring good surfboards and bodyboards – even for just a few hours – and lessons can be easily arranged. We recommend going to the beach early morning or late afternoon to avoid the crowds – with a round of golf in between. Away from the beach there is also a lake area that’s ideal for families. A few kilometres south of Lacanau there are also other great local beaches with fewer facilities but also with fewer tourists. Le Porge and Le Grand Crohot are lovely local beaches lined by pine forests and ideal for surfing and soaking up the rays. Biscarrosse is a town on the Atlantic Coast that really does come alive during summer. The resort is just 70 kilometres south-west of Bordeaux and is often less crowded than beaches closer to the city. It’s well set up for surfing, with board hire and surf schools, plus restaurants and bars. It’s also a good place to try your hand at kitesurfing or windsurfing. Carcans offers a nice mix: a beautiful stretch of sand to relax on, good beach breaks for surfing, and a popular freshwater lake. The beach has a wonderful wild ocean feel (with a few bars and a great pizzeria), while the lake is ideal for families – there are children’s playgrounds and protected swimming areas, as well a more than half a dozen ice-cream parlours. The lake area is a popular windsurfing and sailing spot, with safe conditions for beginners and experienced sailors alike. Arcachon is one of France’s oldest seaside resorts, where the rich and famous once came to play. The boardwalk is still a wonderful place for a stroll, while there are boat rides, wonderful seafood restaurants and sailing all on offer. About an hour from Bordeaux, Arcachon is a quintessential day trip and one we highly recommend. The bay opens up onto the ocean, with the peninsula of Cap-Ferret across the basin giving way to the Atlantic. Don’t miss a detour to Pointe de l’Aiguillon, an old fishing area that’s famous for its red tile-roofed houses. It’s now a busy oyster farming area. The Port of Arcachon itself is the second largest marina along the Atlantic Coast and has almost 3,000 moorings. There’s even a heritage quay reserved for pinasses – traditional long and narrow flat-bottomed boats – which are often moored alongside sailing barges and tall ships. The history of seafaring around Arcachon is evident in a monument ­– designed by French sculptor Claude Bouscau – to remember all those who have perished at sea. The sculpture looks like a cross or an anchor, depending on your viewpoint. 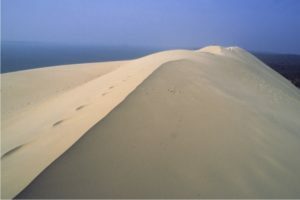 Dune du Pilat– Europe’s largest sand dune – is a remarkable sight. Climb it for great views over the Atlantic Ocean (ideal at sunset but magical any time of day). This natural wonder is just over 100 meters tall and continues on for some 2.7 kilometers, seemingly stopping just short of local houses. It’s great fun for all ages and not to be missed! Soorts-Hossegor is a thriving seaside resort in the Landes region of France. It offers quality beach break surfing – so good in fact that it hosts a leg of the World Surfing Championships each September. The town itself has some great bars and restaurants and a lively nightlife during the high season. A network of cycle paths makes it a joy to ride between your accommodation, the town, beach, and nearby golf courses. As well as La Plage Central there are also famous breaks at Gravière and La Nord beaches. Just to the south is Capbreton, with its lighthouse and its own beach; to the north Seignosse, which has plenty of eating options (it’s a great spot to watch the sun sink into the ocean). The beaches of Biarritz are further south – read our dedicated blog that covers Biarritz. Our Surf and Turf holidays combine the best beaches with the best golf. Browse a sample surf package, or contact us so we can tailor something just for you.